Janmanch also urged NMC to clear the storm water drains immediately and warned that not doing so will create havoc during rains. On Monday, Janmanch, under the leadership of president Anil Kilor, met Union transport minister Nitin Gadkari and informed him of the results of their road audit. 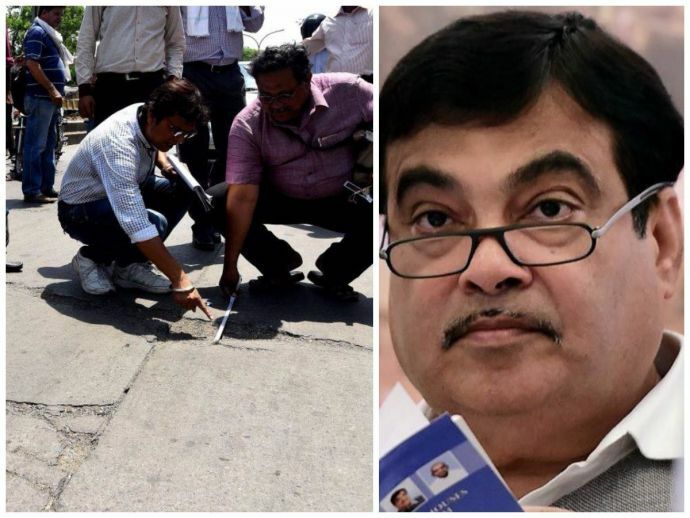 Gadkari has ordered municipal commissioner Ashwin Mudgal to conduct an in-depth probe regarding the issue. So far, Janmanch has done a public audit of three roads. On May 1, the activists inspected the quality of West High Court (WHC) Road. On May 18, they checked the Great Nag Road and on May 20, they did an audit of Public Works Department's Ring Road between Pratap Nagar Square and Khamla Square. Kilor and Janmanch vice-president Amitabh Pawde has reported that the aggregate comprising cement, sand and fly ash had come loose in many spots and the coarse aggregate consisting of gravel had been exposed. Most of them were at a higher level than the doorstep of the houses and during monsoons, water would enter the homes of people living on ground floor. They also said that the paver blocks used by NMC and PWD were not strong. They also urged NMC to clear the storm water drains immediately and warned that not doing so will create havoc during rains. Further the social activists complained about the non-cooperation by PWD officials. "We had urged executive engineer Naresh Wadetwar to send his representative during our public audit. However, he refused to comply. Later, a number of flaws were found in the road constructed by him," said Pramod Pande. Sharad Patil and Prakash Itankar said that the Manch did not support any political party. "We are doing the cement road audit just to stop waste of public money. We approached Gadkari as he is our elected representative and people of Nagpur have great expectations from him," they said. We hope that the issue gets sorted quickly!